Easy Caprese Kebabs - healthy low carb appetizers for summer! 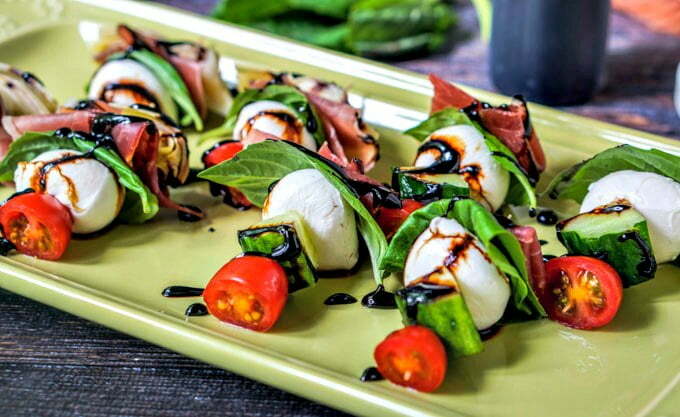 Easy Caprese Kebabs – healthy low carb appetizers for summer! 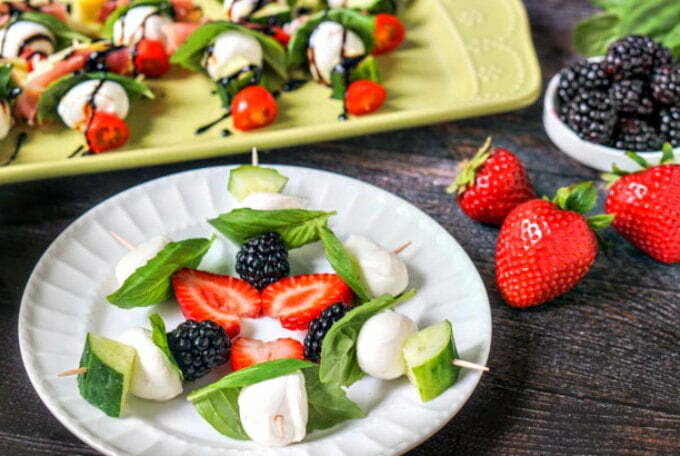 These easy caprese kebabs are a fun and healthy appetizer or even a low carb snack for summer. 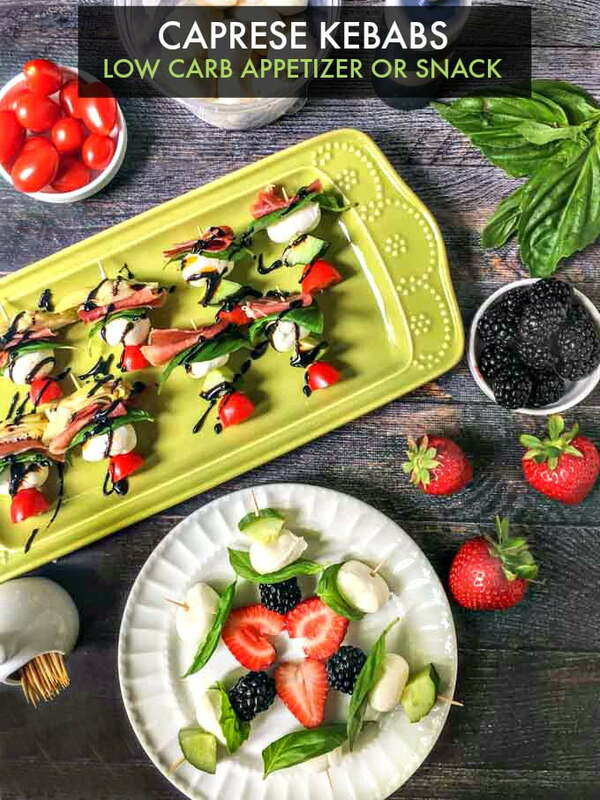 Using a variety of fruits and vegetables with fresh mozzarella and basil and a drizzle of balsamic glaze for a fresh summer bite. Some more low carb appetizers to try are: Greek guacamole, asparagus & green goddess dip, cilantro lime shrimp cocktail and my favorite herb cheese filled bacon rolls. Recently I had a big party for my husband’s birthday. I don’t make everything low carb but I do like to have one or two things that are. 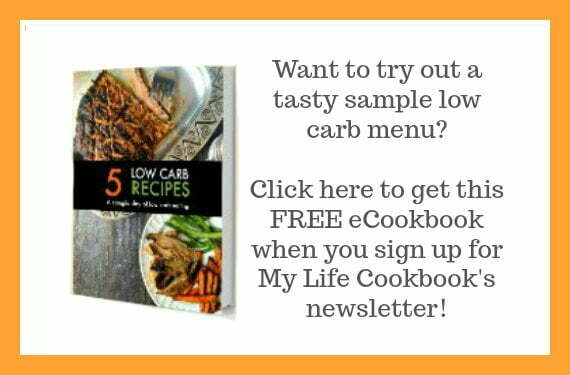 A few people in my family watch carbs or are Paleo and my husband has been doing a lower carb diet too. And because it was a hot summer day I wanted a cool appetizer so these easy caprese kebabs seemed like the perfect solution. 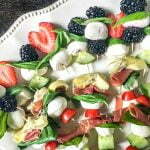 I used a variety of berries, cucumbers, artichoke hearts, prosciutto and each had fresh basil, tomatoes and mozzarella. Oh and I had a balsamic glaze to go on top. 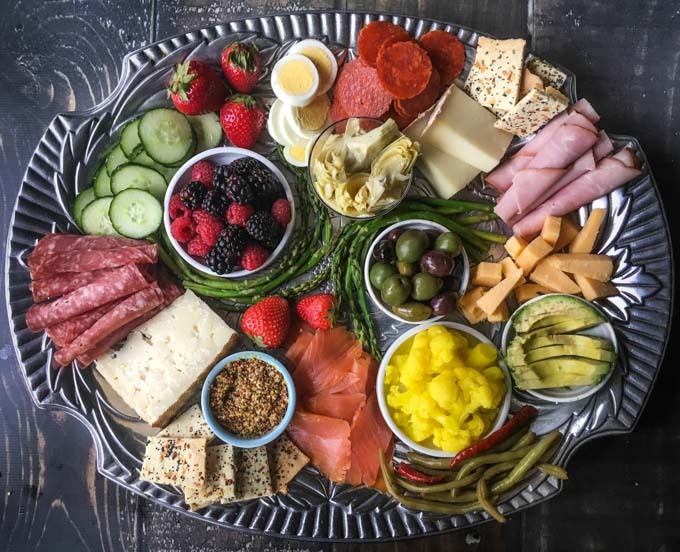 Besides the low carb appetizers I mentioned above, another good one to make for the summer is this cheese platter. We had it for dinner one night but it would also work great for a party! Caprese Insalata is a favorite of ours which is a salad of fresh mozzarella, tomatoes, and basil. We especially like to make them at home in the summer with fresh basil and garden tomatoes! So with that in mind for these kebabs I wanted to use of course fresh mozzarella, basil and grape tomatoes. I found these cute fresh mozzarella balls at both Aldi and Costco. I also picked up a jar of artichoke hearts, sliced prosciutto, seedless cucumbers and berries.Using a mixture of all these ingredients I made a big colorful tray. I also drizzled a bit of balsamic glaze on some and set the little bottle up with the tray for others to use if they pleased. Hope you get a chance to make these this summer. They would also be a great low carb lunch or snack. Enjoy! To make the balsamic glaze, add the vinegar and brown sugar to a sauce pan. Bring to a simmer and cook down until the volume is reduced to half the original. This may take around 10 minutes. 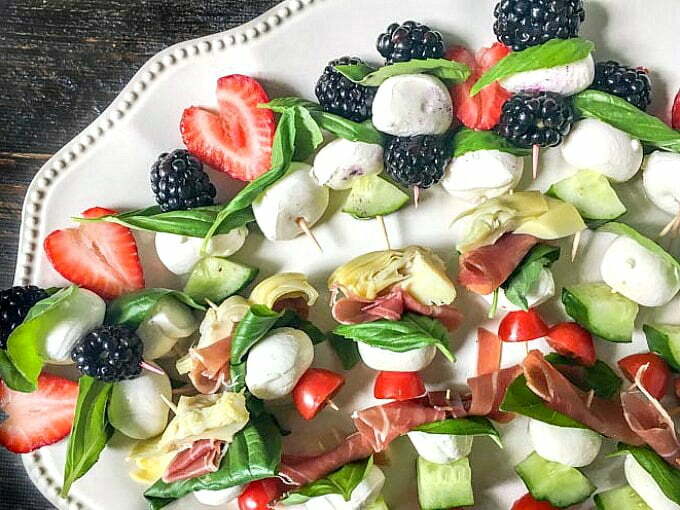 Fruit kebabs with basil leaves, mozzarella balls and a piece of cucumber. 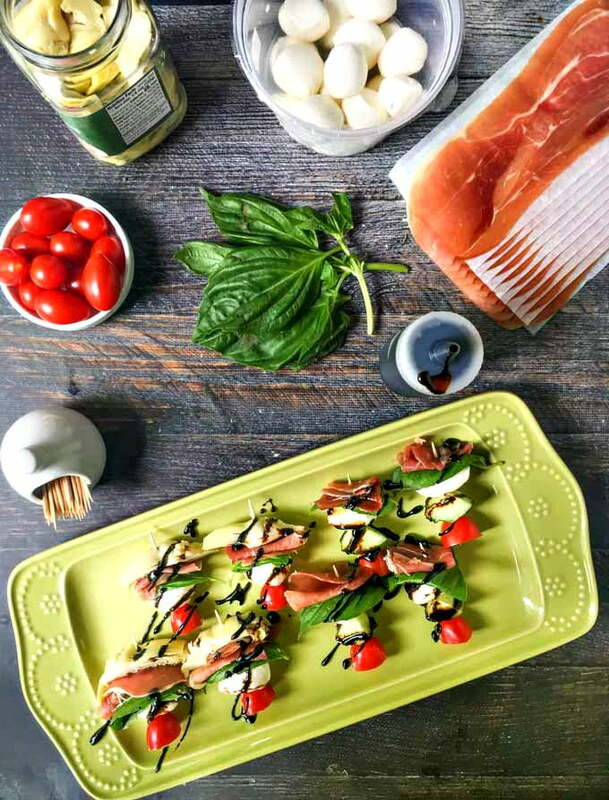 Antipasta kebabs with prosciutto, mozzarella, basil, artichoke hearts and tomatoes. Drizzle the balsamic glaze over the kebabs or serve on the side. NOTE*** I did not add exact amounts because you can make what ever combination you want with whatever ingredients you wish. It's 71 calories for 1 classic caprese kebab without glaze. Previous Post: « Cheesesteak Salad with Parmesan Dressing – a tasty low carb dinner salad!